i cant fax the documents at all! and again i was gastric! coz the tut tut tay ordered the dim sum which was fulled of prawn! i think we were linked by ties of fate... haha! im sure u'll laugh too! I finally bought a new DIY book shelf! "Only screws are provided for the shelf, right?" "Then why do u take a hammer?" "U should take a screw driver, not a hammer..."
"There's a cross on the head of the screws provided?" "Then why do u take flat headed screw driver?" "U should use a sharp headed screw driver for the screws which have a cross on them"
coz i don't even know how to use a screw driver... haha! 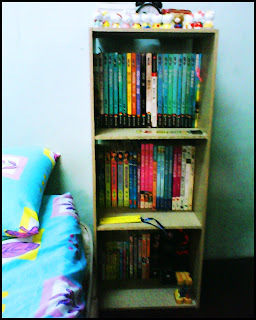 MY FAVOURITE HIYAWU & NOVEL@NET PUBLISHED NOVELS! 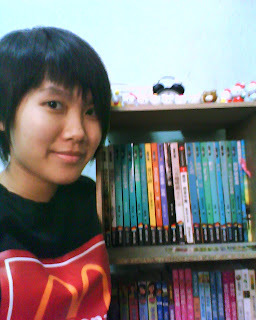 Me & the book shelf! I mean showing his naked body to people! we wont even recognise his face! P/S: I'm leaving for Perak and Penang tomorrow...Gonna miss my computer so much!